Center for Global Integrated Education mission is: to develop, support, and promote integrated educational programs and materials; to foster the development of full human potential; encourage the preservation of global natural resources; and inspire the creation of unity among diverse peoples of the world. 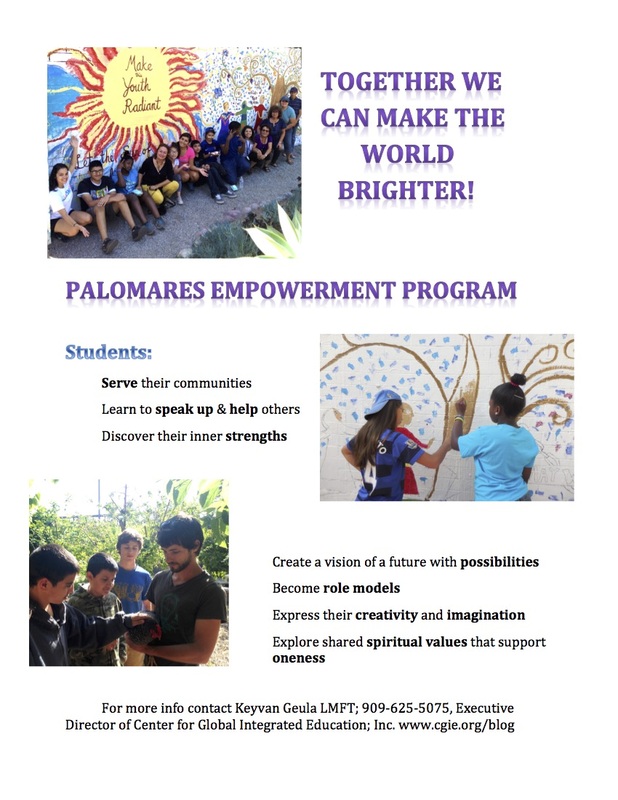 CGIE Empowerment Program began in March 2014 as an after school integrated education program guided by the principle of oneness of all humanity that teaches students how to be smart and good in their choice of thought, intention, action and relations. The curriculum design and outline was kept responsive to the presenting needs of the students with a multiple intelligence approach to education making sure it addresses the key elements of the organic oneness of all humanity evidenced by neuroscience. It was critical that the curriculum and its application attend to the mind as well as the heart of the students. We were convinced that a joy field experiential program will teach not only knowledge, but also wisdom, necessary to navigate successfully through life and spiritual insight required as global citizens to understand why and how we must care for the well being of all as one human race and accordingly do our share to serve humanity and make our global village a home of peace for all. Skill building in the area of multiple intelligences enables students to better serve their community and the greater world community. Through the competency in self-reflection, students learn goal setting and self-improvement. Student gain not only knowledge, but wisdom, spiritual insight and eloquent speech by practicing communication, consultation, collaboration, consensus building, creative and critical thinking in the service of greater good. The Pilot program Site: Palomares Academy of Health Sciences located at Pomona Unified School District in California is chosen as the pilot site for the development and finetuning of the program starting March 2014 in response to the welcoming invitation to Superintendent Richard Martinez valuing the significance of the contribution of faith based communities and CGIE as a Baha’i inspired non profit integrated education organization. Sessions: The Empowerment program meets regularly between one and a half to two and half hours each time after school on campus. Food integrated with spirit of service: The program begins with serving the students a healthy and nutritious snack integrated into the curriculum aiming to feed as well as educate the students about good nutrition by introducing them to fresh fruits and vegetables away from sugary, fatty and salty excesses they are used to. The students enjoy both eating together as well as serving the food to each other other. Student to empowerment teacher ratio: The student to empowerment teacher ratio is one to 5 employing the volunteer services of trained college students, parents, teachers and community members. The diversity of age range amongst the teachers of the program signifies the vital importance of closing the generation gap and modeling healthy adult and youth loving collaboration. Parent involvement: Parents are invited to share feedback and learn how to support their student and the program at home and in school. School personnel and teacher involvement: The program is introduced to the school campus guided and supported by the school principal. The Empowerment Program welcomes school personnel support and participation in a variety of ways that enhances student integrated life. The school principal plays a very important role in welcoming and supporting the program and collaborating closely, providing necessary spaces and venues, being closely familiar with the objectives and goals of the program and how it can promote the principle of oneness throughout the school culture. The loving support and welcoming spirit of the office staff is essential to the success of the program setting an example of oneness, collaboration and service for all. Classroom teachers are introduced to the program and periodically invited to see results of students work so they can recommend students who have the capacity to serve their school and community, making the program sustainable. Classroom teachers are encouraged to collaborate in all aspects of the program and integrate select aspects of their curriculum. Sustainability: The program is sustained by the students developing intellectual, experiential as well as value based competencies utilizing their skills in service of well being of others in the program and in the community at large. Assessment of progress: Students self assess by regular journaling at the end of each session. The journals are reviewed by the program director and empowerment teachers who discuss the on going progress and competency of the students and their specific needs to grow more. Regular journaling sheds light on the highlights of the individual’s experience as well as the group as a whole. The students as well as the teachers share what they learned, thought, felt and what they hope to do to move forward. The assessment will also employ a self-assessment cognitive behavioral tool called STAR, plus consultation with the empowerment teachers. The purpose of the assessment is to identify the strengths and weaknesses of each student and identify what is the next step to further their development towards a greater understanding of the principle of oneness of all humanity and the significant difference one can choose to make to make the world a better place for all. Role of empowerment interns, animators, mentors and parents: The empowerment interns and animators will participate in the ongoing design and development and application o the program in consultation with the director and expert supervisor of the program Keyvan Geula LMFT. The animators will review the result of the application of the curriculum after each class. The purpose of the reflection and evaluation is to address the presenting social, emotional, behavioral and spiritual needs of the students. The ongoing training and supervision of the animators is an integral part o the curriculum design. Parents and their support remain vital for the success and sustainability of the program. Parents are contacted, invited and welcomed to join us in the activities whenever feasible. The student’s classroom teachers: The program invites and welcomes collaboration between school teachers and the Empowerment Program on how to create an environment of peace and oneness in the school community. For example a teacher might ask for an empowerment presentation on the social, psychological and spiritual aspect of healthy eating and prevention of obesity. Building a school garden is another good opportunity for collaboration between the Empowerment Program and classroom teachers using the metaphors in nature to empower and educate the students about their higher nature; integrating the process of learning. The empowerment teachers and mentors regularly reach out to the classroom teachers, parents, grandparents and the community builders to help incorporate the support of the community in integrating the learning experience. CGIE thanks the Pomona Unified School District Superintendent Richard Martinez for his far reaching vision to adopt the Empowerment Program and Principal Beal for offering her wholehearted loving support to test the program on its pilot site at Palomares Academy of Health Sciences.